Located in the heart of the Kimberley, Mornington Wildlife Sanctuary covers more than 3,000 km2 of spectacular gorges and tropical savanna dominated by the Fitzroy River and King Leopold Ranges. Owned and managed by the non-profit Australian Wildlife Conservancy (AWC), Mornington Wilderness Camp provides a comfortable base from which to explore this remarkable sanctuary. It is a naturalist’s paradise, providing refuge for over 200 species of birds and a diverse range of other wildlife. All proceeds from the Wilderness Camp are dedicated to the conservation of wildlife in the Kimberley. AWC offers many enjoyable day trips around Mornington. Popular activities include canoeing down Dimond Gorge and swimming and exploring Sir John Gorge. Before dinner, enjoy a glass of champagne as you watch the sun set over the stunning Central Kimberley ranges. Nature lovers can indulge in various guided and self-guided tours. From birdwatching to exploring habitats unique to the Kimberley, there is something for everyone. 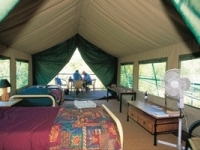 Relax and soak up the atmosphere with a few nights in the safari tents, which overlook Annie Creek. Alternatively, pitch your own tent in the shady campground. In the evenings, dine under the stars at the bush bar and licensed restaurant. For the adventurous traveller, this is a unique opportunity to experience one of Australia’s leading wilderness camps while also helping to save Australia’s endangered wildlife. Mornington Wilderness Camp is open to visitors from May to October - weather and road conditions permitting. The road is suitable for 4WD vehicles only. Please contact the Wilderness Camp for up-to-date information.